No Need to Hunt for Red October. It's Everywhere. - Are You Finished Yet? October is the month of many things: Halloween…Breast Cancer awareness…Hispanic Heritage…National Pizza month (Wikipedia said this is a thing. I swear). But I live in a city that has been lucky enough to usually be able to claim October as Baseball Month. As in post-season baseball. Orange and black may be the official colors of Halloween, but October has traditionally been looking pretty red around these parts. Yes. I watched all 11 minutes and 25 seconds of that video. I even got a little misty during part of it. But Kelly, you cried when Zack and the gang graduated from Bayside on “Saved By the Bell.” I know, but my graduation was right around the corner, and I was feeling very ambivalent about the whole thing. I was just projecting my own emotions about moving on, and when Belding hugged Zack, I just couldn’t help it. Okay? But Kelly, you cry whenever you read the book You Are My I Love You to your kids. I know, but I got that book for my oldest on her very first Christmas, and sentimental children’s books just get me weepy because they are like little love notes that remind me that my love for my kids has no limit, all the while they just think I’m reading them a bedtime story. OKAY? But Kelly, you cried…I GET IT! I’m a cry baby. Is it a crime to feel things so deeply? The baseball video made me teary. Deal with it. I FREAKIN’ LOVE CARDINAL NATION! 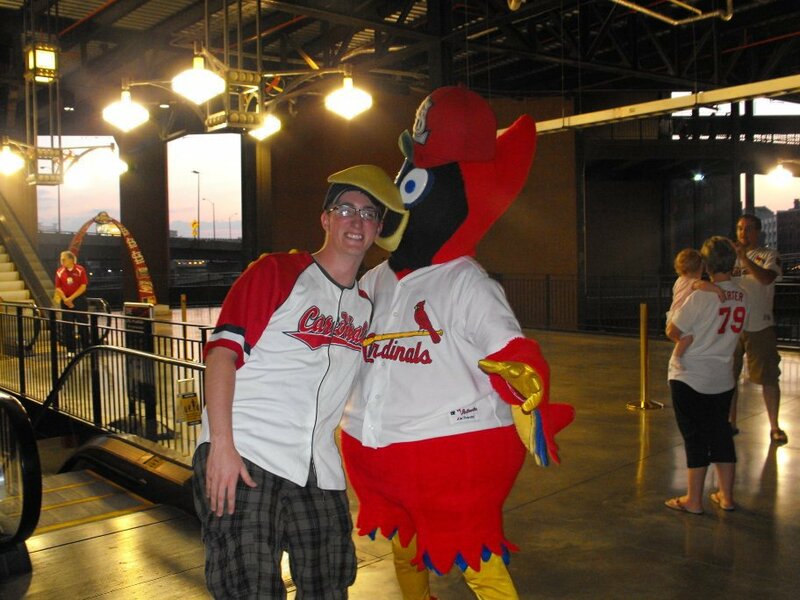 My brother-in-law getting his brains sucked out by Fredbird. Yes, I love our team. Yes, I love our players. Yes, I love our manager Mike Matheny (Oh, how I love him. Have you seen him? Drool.) Yes, I STILL love Willie McGee. I even love Fredbird, that crazy, noggin’-chompin’ feathered feind friend. But what I REALLY love is our fans. Players and managers come and go. But the fans are in it for the long haul. The fans are the ones who high five you. The fans are the ones who can’t hear the songs “Celebration“ or “The Heat is On“ without thinking of Cardinals’ baseball. When you’re sitting in the middle of an aisle, the fans are the ones who grab your beer from the concession guy and pass it down to you…and don’t even steal your change. The fans are the ones who sport So Taguchi masks right along with you, and no one feels like an idiot doing it. The fans are the ones who invite you over to watch the game and feed you pizza. When they catch a fly ball, the fans are the ones who give it to the kid sitting in front of them. The fans are the ones who flood your Facebook feed with real-time comments on the game and clever memes about the Cubs being losers, all which you inevitably have to “like.” The fans are the ones who stick around whether we win or lose. When everyone is just a little tired of wearing dress clothes to work, the fans are the ones who declare a “wear your red” day at the office. The fans are the ones who have portable radios or stream the game on their smartphones during grade school soccer games that are inconveniently scheduled during playoff season. The fans are the ones who bring their loyalty with them, even when they move to other corners of the world. And whether it has been Rogers Hornsby, Stan Musial, Bob Gibson, Lou Brock, Ozzie Smith, Mark McGwire, or David Freese (sorry Pujols, you’re dead to me) at the plate, the Cardinal fans have been the ones who have always been there…holding their breath, appreciating the anticipation, and riding the high that can only come from watching a pair of red cleats cross home plate. The Cardinals are currently battling the Dodgers for the National League Championship. For the next week, St. Louis social calendars will involve only activities where a television can be accessed. And while we take our wins rather seriously around here, it ultimately doesn’t matter if we end up winning the NLCS series…or even the World Series. Because we’re fans. We’re all in. It’s not even a question of go big or go home. We go big every.single.time. Several cups of tea later and it’s still bugging me that I didn’t ask if your brother-in-law got his face back? Thankfully, Fredbird is merciful. So, yes. I love your description of your fans SO MUCH. I wish I had that for one of my particular teams that I love so dearly … but they tend to be fairweather … which I CANNOT ABIDE and they need to #keeponsteppin ’cause I’ve got NO ROOM for flaky “fans”. Your fans would be ones I loved like you do!! So, this whole comment thread actually led me to update the post and add that whole thing about respecting other fans. High five to you for helping me step up my game!!! Sweet! I’ll go check it out. I LOVE this level and type of fandom so much! In fact, I was writing part of this post during the game! Cardinal Nation Is the Best! And Kelly I watched all 11 minutes of that video and got misty too! Aw. I love that. I didn’t go to a big football school, so I’m a bit of an orphan when it comes to that. But sometimes I do feel like I’m missing out when I see others so passionate about college football. Thankfully, baseball seems to be enough for me. 🙂 And you bring up another great thing about sports fandom…it crosses generations and is a common language. I’m not even a baseball fan, but now I have to admit, that Mike Matheny has a new fan. Gorge! As usual, another great piece o’ writin’ from St. Louis. You go, baseball girl! Thank you. And yes. He is yummy. Remember the Time…Wildcard Edition | Are You Finished Yet? 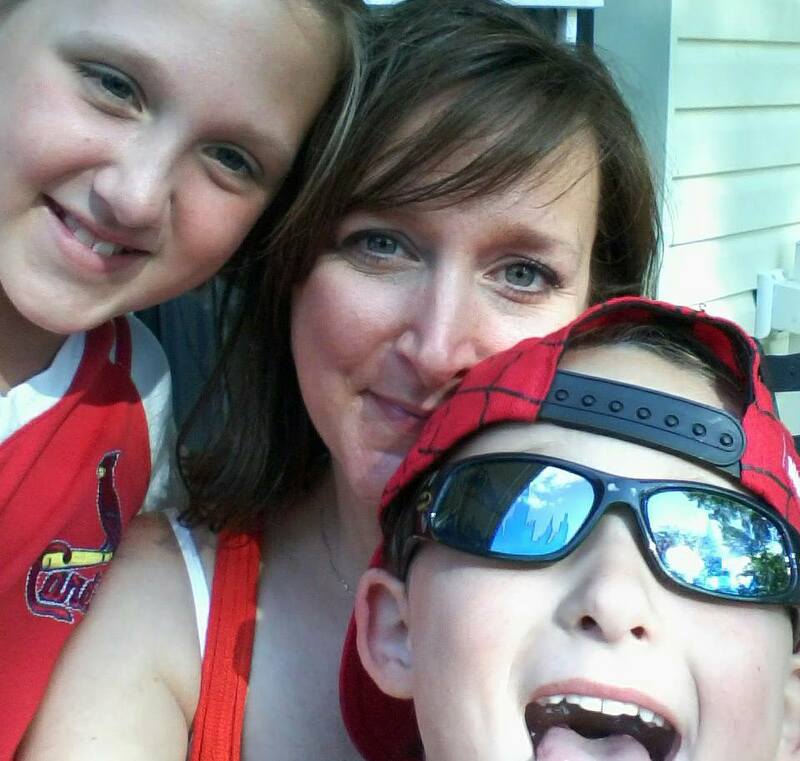 An Old Dog, Uncle Jesse’s Papouli, and Cremation: Ruining a Child’s Life In One Brief Conversation | Are You Finished Yet?